Objective: To quantify the association between walking and the risk of cardiovascular disease (CVD) and all-cause mortality in healthy men and women. Data sources: Medline, Cochrane Database of Systematic Reviews, and Web of Science databases were searched to May 2007. Study selection: Prospective epidemiological studies of walking and CVD and all-cause mortality. Results: 18 prospective studies were included in the overall analysis, which incorporated 459 833 participants free from CVD at baseline with 19 249 cases at follow-up. From the meta-analysis the pooled hazard ratio of CVD in the highest walking category compared with the lowest was 0.69, (95% CI 0.61 to 0.77, p<0.001), and 0.68 (0.59 to 0.78, p<0.001) for all-cause mortality. These effects were robust among men and women, although there was evidence of publication biases for the associations with CVD risk. Walking pace was a stronger independent predictor of overall risk compared with walking volume (48% versus 26% risk reductions, respectively). There was also evidence of a dose–response relationship across the highest, intermediate, and lowest walking categories in relation to the outcome measures. Conclusions: The results suggest walking is inversely associated with clinical disease endpoints and largely support the current guidelines for physical activity. The mechanisms that mediate this relationship remain largely unknown and should be the focus of future research. The World Health Organization has stated that overall physical inactivity is estimated to cause 1.9 million deaths and 19 million disability adjusted life years globally. The current guidelines on cardiovascular prevention recommend at least 30 minutes of moderate intensity physical activity on five or more days of the week or 20 minutes of vigorous exercise on three days of the week.1 A substantial proportion of adults do not, however, achieve these guidelines,2 3 with an estimated 60% of the global population failing to meet minimum amounts of activity. Moderate intensity physical activities that can be incorporated into everyday life, such as walking, may be beneficial for improving adherence levels. Indeed, walking appears to be the preferred activity among sedentary individuals taking up physical activity.4 Much of the earlier epidemiological work has examined general leisure time physical activity or energy expenditure, but did not consider specific activities. A previous meta-analysis has shown beneficial effects of walking on blood pressure in controlled trials,5 although we are unaware of any work to date that has systematically reviewed walking as a specific activity in relation to chronic disease endpoints. The magnitude, dose–response relationship, and effectiveness of walking compared with more vigorous activities remain unclear. We therefore systematically reviewed evidence from prospective epidemiological studies of walking and cardiovascular disease (CVD) and all-cause mortality. We primarily addressed four questions: (1) is walking associated with a risk of CVD and all-cause mortality? (2) are there any gender differences? (3) is walking volume or intensity more beneficial? (4) is there evidence of a dose–response relationship? We adhered to the guidelines for reporting meta-analysis of observational studies in epidemiology (MOOSE).6 We searched Medline, the Cochrane Database of Systematic Reviews, and Web of Science databases from 1970 to 2007 using key words “physical activity” or “walking” or “exercise” in combination with “coronary heart disease”, “cardiovascular disease”, and “mortality” and also examined the reference lists of the retrieved articles. We limited the current systematic review to prospective cohort epidemiological studies in an attempt to eliminate selection and recall bias. We also excluded studies in which the effects of walking were combined with other activities such as cycling in commuting activity. Taken together, the criteria for inclusion were as follows: (1) English language full-length publication in a peer-reviewed journal; (2) prospective cohort studies in healthy men and women at baseline, with measures of CVD (fatal and non-fatal) and/or all-cause mortality at follow-up; (3) measures of habitual walking volume (time/distance) or intensity at baseline. Incident CVD was identified from a range of outcomes in the present studies, which included death from coronary causes, myocardial infarction, angina pectoris, stroke, congestive heart failure, and coronary revascularisation procedures. Information on participants and study characteristics, measurement of exposure and outcome, adjustment for potential confounders, and hazard ratio (HR) or relative risks (RR) with 95% confidence intervals (CI) was abstracted by one author (MH) and verified by another (YC). Assessment of quality was made on the basis of the accuracy of the self-reported physical activity questionnaire, evaluation of outcome, and adjustment for potential confounding, which comprised a total score ranging from 0 to 7 (shown in supplementary material available on-line only). Quality and validity were assessed independently by both reviewers and any discrepancies were resolved by discussion. We identified 4295 articles in the literature search, which is shown in the flow diagram (see supplementary material available on-line only). Of these, 18 cohort studies met the full inclusion criteria, which incorporated 459 833 participants and 19 249 cases with a mean follow up of 11.3 years (see table 1). The total quality scores for each study ranged from 3 to 6, averaging 5.3 (see supplementary material available on-line only). Thirteen studies examined CVD and 10 studies recorded all-cause mortality. Seven studies were performed in men only, six in women, and five in mixed samples. Self-reported walking time was most frequently examined in 11 studies, four studies recorded walking distance, six walking pace, and two energy expenditure. The categorisation of the highest walking exposure groups averaged more than 5.2 hours per week or more than 17.2 km per week, although there was considerable variation between studies, which ranged from more than 1 hour per week to more than 2 hours per day and more than 9.7 km per week to more than 20 km per week. Walking pace was generally assessed as a “relative” rather than an “absolute” measurement, although several studies15 22 defined “brisk” as more than 4.8 km per hour and “moderate” as 3.2–4.6 km per hour. 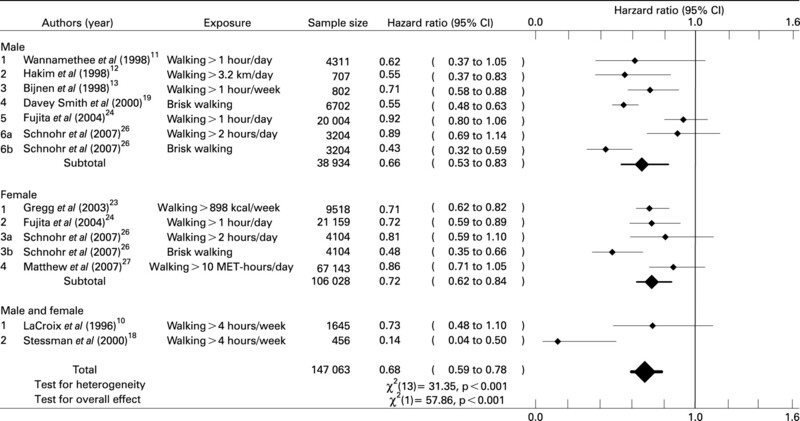 Figures 1 and 2 show the associations between walking and CVD and all-cause mortality, respectively. The pooled HR of CVD in the highest walking category compared with the lowest was 0.69 (95% CI 0.61–0.77, p<0.001), and 0.68 (0.59–0.78, p<0.001) for all-cause mortality. There was significant heterogeneity for the effect of walking on CVD, χ2 (17) = 47.68, p<0.001, and all-cause mortality, χ2 (13) = 57.86, p<0.001. There was also evidence of publication bias in the case of CVD (p = 0.007), which suggests unpublished negative findings from smaller studies may exist. There was no evidence of publication bias for all-cause mortality (p = 0.24). In addition, we examined the HR of minimal walking levels compared with the referent category in an attempt to address the dose–response issue (using the same studies as for the main analyses). In these analyses, the average walking time/distance in the minimal walking categories was approximately 3 hours per week (ranging from ∼30 minutes per week to ∼5 hours per week) or 9.8 km per week (ranging from ∼5 km per week to ∼15 km per week), which equated to a casual or moderate walking pace of approximately 3 km per hour. The pooled HR for CVD was 0.84 (0.79 to 0.90, p<0.001; χ2 (14) = 15.84, p = 0.32), and 0.80 (0.71 to 0.91, p<0.001; χ2 (9) = 29.78, p<0.001) for all-cause mortality. These effects did not display publication biases. Taken together these analyses provide evidence for a dose–response relationship, with the strongest effects observed at the higher walking volume/intensity. Figure 1 The association between walking and cardiovascular risk in men and women. The referent group refers to the lowest walking (volume/intensity) group and hazard ratios of less than 1.0 suggest benefits of walking. MET, metabolic equivalent. Figure 2 The association between walking and all-cause mortality in men and women. The referent group refers to the lowest walking (volume/intensity) group and hazard ratios of less than 1.0 suggest benefits of walking. MET, metabolic equivalent. In the various subgroup analyses that we performed there were no differences in effect sizes between men and women (see figs 1 and 2), although the effects in women displayed less heterogeneity for CVD, χ2 (8) = 10.54, p = 0.23, and all-cause mortality, χ2 (3) = 10.0, p = 0.04 compared with large heterogeneity in men. When we compared walking volume (time and distance)10–18 20–22 24–26 with walking pace (intensity)15 19 20 22 26 in a combined analysis of CVD and all-cause mortality the effects were more robust for brisk walking pace, HR = 0.52 (0.48 to 0.57, p<0.001), χ2 (6) = 4.8, p = 0.57, compared with higher walking volume, HR = 0.74 (0.69 to 0.80, p<0.001), χ2 (22) = 44.6, p = 0.003. A dose–response effect was again demonstrated at moderate pace walking (0.71, 0.62 to 0.81, p<0.001) and lower levels of walking volume (0.90, 0.85 to 0.95, p<0.001). The levels of walking in higher and lower walking volume groups in these analyses were comparable to those described in previous analyses. The adjustments for potential confounding are displayed in table 1. Virtually all studies made adjustments for age, smoking, and alcohol. Two other potentially important confounders, however, adiposity and other physical activities, were not consistently included. Only five studies adjusted for both of these important confounders11 16 17 25 26 although sensitivity analyses that compared the effects of these studies with the others did not uncover any notable effects. We also performed further sensitivity analyses based on study quality scores, which compared the effects of high quality studies (with a score of 6) with lower quality studies (with a score of less than 6) although the results were unremarkable. The main aim of the present meta-analysis was to examine the association of walking with cardiovascular risk and all-cause mortality. Cumulative evidence from 18 prospective cohort studies suggests there is an inverse dose–response relationship between walking and these clinical endpoints. Significant associations were also observed at lower walking levels that are equivalent to the current guidelines for cardiovascular prevention, which recommend at least 2.5 hours per week of moderate intensity physical activity. There may be large variations in the individual level of exercise intensity that is elicited by a given dose of walking, which may differ according to age, gender, baseline fitness levels and physical function, and environmental factors, thus relative measures are useful indicators in epidemiological studies. We found evidence for a linear dose–response relationship for both walking pace and volume in relation to clinical endpoints. These findings are not consistent with a recent meta-analysis of randomised controlled trials in which there were no linear dose–response relationships between walking volume and a number of cardiovascular risk factors.5 The authors, however, described an intensity versus volume tradeoff, suggesting that lower volume walking interventions tended to prescribe walking at higher relative intensities that may confer the same benefit as walking for longer periods at lower intensity. The discrepancy between the results of the present study and those of the previous meta-analysis may also be explained by greater exposure times in epidemiological studies and the possibility that only limited effects can be observed from relatively short-term interventions. Alternatively, the association of walking with different intermediate health outcomes may not be the same. In addition, it is likely that the participants in some trials were not sedentary at baseline, thus leading to the possibility of a ceiling effect. One of the main difficulties in epidemiological analyses is to exclude the possibility of residual confounding, which may otherwise explain the association between two variables. In the present analyses we used risk estimates from multivariate models with the most complete adjustment for potential confounders. We observed limited adjustment for certain confounders, however, such as other forms of physical activity. Given that individuals who are regularly walking may lead a generally more active lifestyle, some of the benefits of walking may be especially confounded by other forms of physical activity. Given that one of the benefits of taking up a walking programme may be to develop a generally more active lifestyle, then this might be considered an intermediate variable in the causal relationship and further controlling for other activity represents over-adjustment. Similarly, the role of adiposity in mediating the effects of physical activity is a controversial area,36 and if adiposity is indeed an intermediate factor then adjustment may diminish the true effects of walking. Another important confounding variable that was seldom considered was the impact of physical functioning on the ability to walk. Because various disease processes have been related to disability,37 38 impairment in activities of daily living could mediate associations between walking and mortality. Finally, an important issue is publication bias. Our analyses suggest the presence of unpublished negative findings, which may be because epidemiological studies in physical activity do not consistently collect and present detailed measures of self-reported walking. Indeed, we excluded a large number of studies because results were more often presented for total physical activity and not specific activity types. Several plausible mechanisms exist for the association between walking and reduced cardiovascular risk. In a previous review of 24 randomised controlled trials, walking interventions increased aerobic capacity and reduced adiposity and diastolic blood pressure in previously sedentary adults.5 We have also demonstrated inverse associations between weekly walking duration and markers of haemostasis and inflammation in middle-aged men and women, independently of other risk factors.39 The association between walking and the risk of all-cause mortality may be partly due to a reduced risk of cancer12 19 23 although further research is required to confirm these findings. MH had full access to all of the data in the study and takes responsibility for the integrity of the data and the accuracy of the data analysis. MH was responsible for the study concept and design and acquisition of data. Both authors were responsible for the analysis and interpretation of data. MH drafted the manuscript and both authors were responsible for critical revision of the manuscript for important intellectual content YC was responsible for statistical analysis.
. Physical activity and public health. Updated recommendation for adults from the American College of Sports Medicine and the American Heart Association. Circulation 2007;116:1081–93.
. Physical activity among adults: United States 2000. Advance data from vital health statistics, no. 333. Hyattsville, MD: National Center for Health Statistics, 2003.
. Temporal trends in physical activity in England: the Health Survey for England 1991 to 2004. Prev Med 2007;45:416–23.
. Six-month physical activity and fitness changes in Project Active, a randomized trial. Med Sci Sports Exerc 1998;30:1076–83.
. The effect of walking on fitness, fatness and resting blood pressure: a meta-analysis of randomised, controlled trials. Prev Med 2007;44:377–85.
. Publication bias and dissemination of clinical research. J Natl Cancer Inst 1989;81:107–15.
. Meta-analysis software user’s guide. In: Masui K, ed. Kokokara-hajimeru meta-analysis. Tokyo: Shinko-Koueki Medical Press, 2003:91–121.
. Does walking decrease the risk of cardiovascular disease hospitalizations and death in older adults? J Am Geriatr Soc 1996;44:113–20.
. Effects of walking on mortality among nonsmoking retired men. N Engl J Med 1998;338:94–9.
. Physical activity and 10-year mortality from cardiovascular diseases and all causes: the Zutphen Elderly Study. Arch Intern Med 1998;158:1499–505.
. Effects of walking on coronary heart disease in elderly men: the Honolulu Heart Program. Circulation 1999;100:9–13.
. A prospective study of walking as compared with vigorous exercise in the prevention of coronary heart disease in women. N Engl J Med 1999;341:650–8.
. Physical activity and cardiovascular disease risk in middle-aged and older women. Am J Epidemiol 1999;150:408–16.
. Physical activity and coronary heart disease in men: the Harvard Alumni Health Study. Circulation 2000;102:975–80.
. The effects of physical activity on mortality in the Jerusalem 70-Year-Olds Longitudinal Study. J Am Geriatr Soc 2000;48:499–504.
. Physical activity and cause-specific mortality in the Whitehall Study. Public Health 2000;114:308–15.
. Physical activity and coronary heart disease in women: is “no pain, no gain” passe? JAMA 2001;285:1447–54.
. Walking compared with vigorous exercise for the prevention of cardiovascular events in women. N Engl J Med 2002;347:716–25.
. Exercise type and intensity in relation to coronary heart disease in men. JAMA 2002;288:1994–2000.
. Relationship of changes in physical activity and mortality among older women. JAMA 2003;289:2379–86.
. Walking and mortality in Japan: the Miyagi Cohort Study. J Epidemiol 2004;14:S26–32.
. Walking and sports participation and mortality from coronary heart disease and stroke. J Am Coll Cardiol 2005;46:1761–7.
. 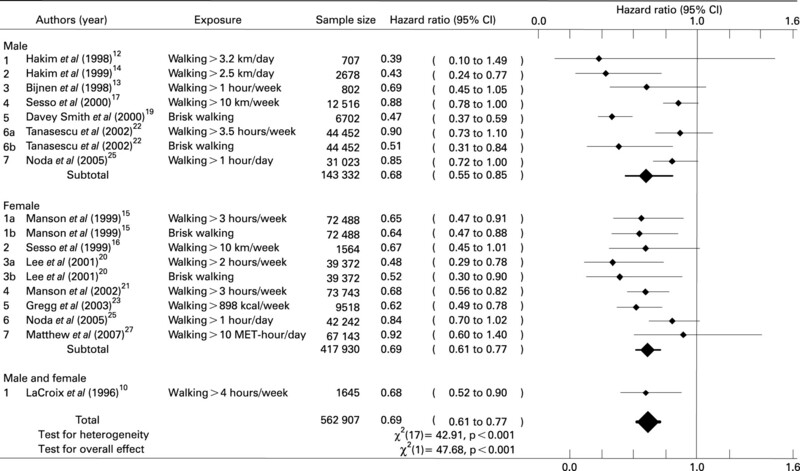 Intensity versus duration of walking, impact on mortality: the Copenhagen City Heart Study. Eur J Cardiovasc Prev Rehabil 2007;14:72–8.
. Influence of exercise, walking, cycling, and overall nonexercise physical activity on mortality in chinese women. Am J Epidemiol 2007;165:1343–50.
. Relative intensity of physical activity and risk of coronary heart disease. Circulation 2003;107:1110–16.
. Vigorous exercise in leisure-time: protection against coronary heart disease. Lancet 1980;2:1207–10.
. Relation of leisure-time physical activity and cardiorespiratory fitness to the risk of acute myocardial infarction. N Engl J Med 1994;330:1549–54.
. Exercise intensity and longevity in men. The Harvard Alumni Health Study. JAMA 1995;273:1179–84.
. Leisure-time physical activity levels and risk of coronary heart disease and death. The Multiple Risk Factor Intervention Trial. JAMA 1987;258:2388–95.
. Leisure time physical activity and coronary heart disease death. The US Railroad Study. Circulation 1989;79:304–11.
. Physical activity and ischaemic heart disease in middle-aged British men. Br Heart J 1991;66:384–94.
. Speed and exercise intensity of recreational walkers. Prev Med 2002;35:397–400.
. The fitness, obesity, and health equation: is physical activity the common denominator? JAMA 2004;292:1232–4.
. D-dimer and inflammatory markers as predictors of functional decline in men and women with and without peripheral arterial disease. J Am Geriatr Soc 2005;53:1688–96.
. Association of long-distance corridor walk performance with mortality, cardiovascular disease, mobility limitation, and disability. JAMA 2006;295:2018–26.
. Walking, vigorous physical activity, and markers of haemostasis and inflammation in healthy men and women. Med Sci Sports Exerc 2007;39:S311. National Institute for Health and Clinical Excellence (NICE). Physical activity public health intervention guidance, UK, 2006. http://guidance.nice.org.uk/PHI2 (accessed 5 June 2007). Funding: Dr Hamer is supported by a British Heart Foundation (UK) grant. The funding agencies had no role in the design and conduct of the study; in the collection, management, analysis, and interpretation of the data; or in the preparation, review, or approval of the manuscript. British Journal of Sports Medicine 2008; 42 235-235 Published Online First: 04 Apr 2008.